Those pesky ducks! I can't view the last video - it says it's private and needs invitation? Oh, Rose, so sorry! I think I've fixed that last video now. Hope you try again. It still says "unavailable", but I'm guessing you said "It gets better." I was surprised, I thought maybe they just didn't like the cold in the morning. Am in class and can't see them from here. Will look at them when I'm back next week. You're such a good chicken Mommy! Are those beige and whites 'runner ducks'? If so, maybe running others off is how they get their name. I am sitting alone laughing and I THANK YOU. I am recently jobless, we put a dog down last night and it never seems to get any better. I am tempted to play your message to the hens each morning for myself, to remind me that yes...I WILL get through this! Johanna, I don't know how I missed your blog. You left a comment on mine back in August and I just found you. So glad I did. This is so funny. 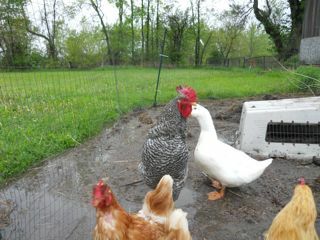 Chicken bullying is rampant on our farm so good to see the ducks take a little stand here :) I am glad to find you. Amy, welcome! Glad to see you here again. And to everyone, we will all get through this together. I just wandered on to your blog from Gardenweb Forums (Yahoo). Love at first sight and listen. I immediately liked the infusion of literary references. Then, I happened upon your NAMI walk mention. This morning, I took the brash step of posting on FB the Huff Post's story on Glenn Close's fight to destigmatize mental illness due to her siblings' illnesses. My comment said the story hit home. I have never hidden my own bipolar diagnosis, even from my university students. I do have to be more politic about my son's. He's been on meds (and spent years in therapy) since age 10, so your mention of your niece (?) was special to me. My son's life has not been easy, nor has it been easy parenting for my husband and me. Mental illness is indeed a family disease. My dear friend's son (50) was murdered last week in a drug deal gone wrong. He suffered from bipolar disease his entire life. I cannot tell you how wonderful gardening has been for me, lifting body/mind/spirit (no Cartesian split, which I mention since it appears you are into the Enlightenment philosophers). Thanks for your work, and I hope you will continue your sensitive infiltration of it into the blog when you feel it's appropriate. Thanks, indeed, for your post. I am very sorry for the loss you just suffered. 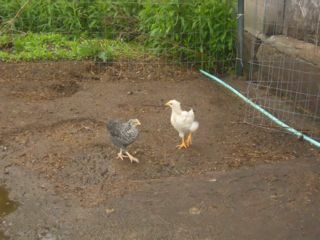 My family suffered something similar last summer (http://meatbusysolitudefarm.blogspot.com/2010/08/day-in-court.html). It's a terrible situation with no real sense of "justice". Perhaps if the stigma of MI was less, these people would not end up committing such awful crimes.